February 12, 2019, 11:45 p.m. If you had lived during the Cretaceous, dinosaurs might have been the least of your worries. Apparently, the ancient underbrush was also teeming with predatory spiders with hypnotic, glowing eyes, reports Phys.org. In a remarkable find, researchers have unearthed rock fossils of an extinct spider family that contain reflective materials once contained inside the arachnids' eyes. When a light is shined upon the fossils, the eyes of the fossilized spiders still shimmer, appearing to come back to life with an eerie glow. An image of the fossils with glowing eyes can be viewed here. "Because these spiders were preserved in strange slivery flecks on dark rock, what was immediately obvious was their rather large eyes brightly marked with crescentic features," said Paul Selden, coauthor on the paper showcasing the find. "I realized this must have been the tapetum — that's a reflective structure in an inverted eye where light comes in and is reverted back into retina cells. This is unlike a straightforward eye where light goes through and doesn't have a reflective characteristic." Structures like these spider tapetum can be found in many creatures alive today, most typically among nocturnal predators like cats and dogs, but also among bovine and deep sea fish. The tapetum is the reason cat eyes often shine brightly in pictures taken by a camera with a flash, and why the eyes of some critters can be seen eerily peering back at you when you shine a flashlight toward them at night. Because the tapetum can increase light upon the retina cells, it's most useful for animals that roam at night, so it's likely that this was also the case for these ancient spiders. This is also the first time that a tapetum has ever been found in a fossil. The fossils were unearthed from an area of Korean shale known as the Jinju Formation, and are dated from between 110 and 113 million years ago. The fact that the reflective tapetum of these spiders has managed to remain preserved for so long is a testament to the value of this region for fossil discovery. "This is an extinct family of spiders that were clearly very common in the Cretaceous and were occupying niches now occupied by jumping spiders that didn't evolve until later," said Selden. "But these spiders were doing things differently. Their eye structure is different from jumping spiders. It's nice to have exceptionally well-preserved features of internal anatomy like eye structure. It's really not often you get something like that preserved in a fossil." 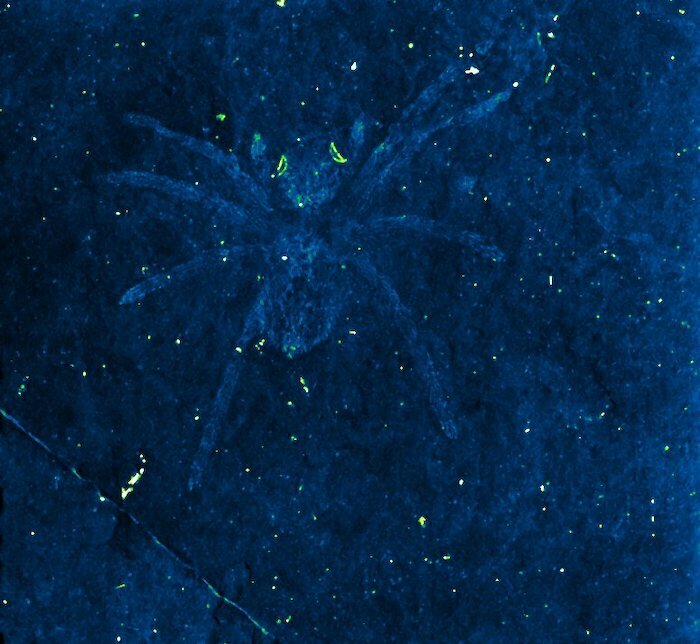 Researchers have unearthed fossils of an extinct spider family that contain reflective material in the eyes that gave them superior night vision.